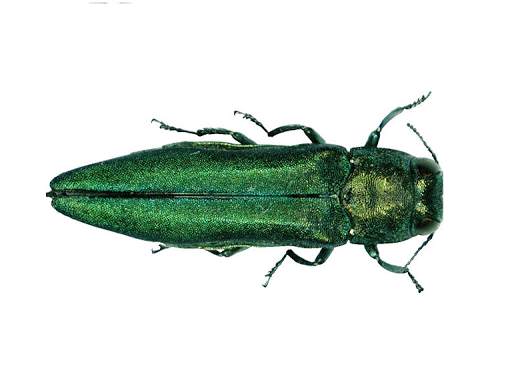 Emerald Ash Borer Alert! | Bowman's Pro Turf, LLC. 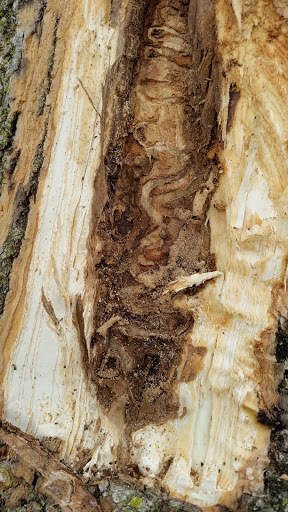 A few weeks ago I called the Indiana Department of Natural Resources to report more ash trees in Vigo County that are infected with Emerald Ash Borer’s. We were told that the Emerald Ash Borer infestation in Indiana is so severe that they can no longer manage the database to track it. There are 150 million ash trees in Indiana. Without proper identification, care, and maintenance of ash trees, we are facing a very serious problem! Emerald Ash Borer’s are not native to the United States. This invasive species likely came from Asia through shipping containers and survived for about 10 years before being discovered. As the name suggests, this green insect attacks ash trees. It spreads naturally and through human movement of infested firewood. The Emerald Ash Borer (EAB) creates D shaped holes in the tree. These holes are random throughout the tree and seem to have no uniform placement. Simply put, the Emerald Ash Borer destroys ash trees. Burrowing under the bark of an ash tree, it creates tunnels that eventually overtake the trees ability to survive. Over time, the canopy of the tree will start to die back. We use the canopy as a gauge to measure how much damage has been done and how likely we will be able to save the tree. All ash trees are at risk at this time. Because the infestation can only be handled by properly treating the EAB, ash trees MUST be treated in order to survive. It is only a matter of time for an uninfected ash tree to be overcome by the EAB. Unfortunately, the only way known to address this problem is to treat ash trees. If an ash tree is not infected but is being treated, any EAB that tries to make that tree home will be killed. If a tree is already infected, the treatment will work up through the vascular system of the tree and kill the EAB. If ash trees are not treated, they will die. If an ash tree dies from EAB damage, it will need to be cut down and disposed of properly. The cost of properly removing an ash tree is far greater than treating! Ash trees are important to our environment in Indiana and around the country. We need to do what we can to protect them from this nasty invasive species. If you have an ash tree or want us to come identify your tree, give us a call! We will come out and inspect your ash trees for free and give you an estimate of what it would cost to treat them to protect from the Emerald Ash Borer. We have seen several neighborhoods in the Wabash Valley that have a very large EAB infestation. The chances are that if your ash tree is not infested now, it will be soon. Be sure to follow us on Twitter, Facebook, and Instagram! Head over to our website for more information about services we offer.